Amatrol’s Mechatronics RF Identification Learning System – AB Compact Logix (87-RF1AB53) – covers RFID (Radio-frequency identification) technology and it’s applications in automated processes popular in industries like automotive, pharmaceutical, and agricultural. 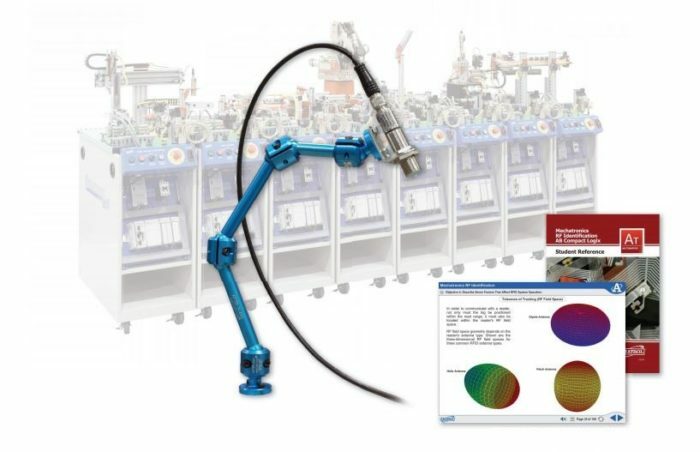 This learning system uses an RFID reader to read RF tags on parts traveling through Amatrol’s 870 Mechatronics Learning System which then signals a PLC to assemble parts according to the part number listed on the RF tag. RFID is a wireless, non-contact method of data transfer that is growing in popularity due to its read reliability, tags being less susceptible to damage than printed barcodes, longer read distance, and ability to record product manufacturing history. The 87-RF1AB53 includes an RFID reader, mounting hardware, RF tags, interactive multimedia, a student reference guide, and much more! Used in conjunction with select 870 mechatronics stations with Allen-Bradley Compact Logix programmable logic controllers (PLC), this learning system will be used to cover topics such as RFID function, applications, and basic operation before moving on to hands-on RFID skills. Learners will use the 87-RF1AB5300’s real-world industrial components to build skills used in actual industrial and manufacturing environments. Featured components include: an Radio-frequency identification reader that can be affixed to a mechatronics station and features EtherNet I/O, a flexible reader mounting fixture, six RF tags, and programming software. Required learning systems to use the 87-RF1AB5300 include one of the following mechatronics station with Allen-Bradley Compact Logix PLCs: a combination of Orientation Processing (Station 3) and Sorting / Buffering (Station 4), Servo Robotic Assembly (Station 5), or Torque Assembly (Station 6) and Inventory Storage (Station 7), or stand-alone use with Station 5. Learners will use this combination of learning systems to practice important mechatronics and manufacturing skills such as using a reader to sort parts into four different bins based on material; using a robot to place a part near the RFID reader in order to tell the PLC the correct spool to use in assembly; and reading parts on a rotary table, which tells the PLC on the next mechatronics station whether the part is metal or plastic. The 87-RF1AB53 features world-class interactive multimedia curriculum that covers a wide depth and breadth of topics surrounding radio-frequency identification and its applications in industry. Some of these topics include RFID function, applications, basic operation, and types of Siemens RFID systems. This curriculum is presented in a highly interactive multimedia format that fully engages learners by integrating text, audio, 3D graphics, quizzes, and animations. If you need to teach these invaluable Radio-frequency identification skills but own Amatrol’s mechatronics stations with Siemens S300 Series PLCs (313, 314, and 315), then Amatrol suggests the Mechatronics RFID Reader – Siemens S300 Series Learning System. The 87-RF1S7300 includes all of the content and skills featured with the 87-RF1AB53 except this learning system is written specifically for customers with Siemens 300 Series PLCs. A sample copy of the Mechatronics RF Identification Student Reference Guide is also included with the system for your evaluation. Sourced from the system’s multimedia curriculum, the Student Reference Guide takes the entire series’ technical content contained in the learning objectives and combines them into one perfect-bound book. Student Reference Guides supplement this course by providing a condensed, inexpensive reference tool that learners will find invaluable once they finish their training making it the perfect course takeaway.